his way cool vacation begins in Brisbane. Your driver will meet you at Brisbane’s International Airport and take you north, to Australia’s best beaches on the Sunshine Coast. You stay 3 nights at the Hyatt Coolum Resort – the home of the Australian PGA Championship. The Resort is consistently recognized as one of Australia's finest all-encompassing luxury resort destinations, providing superior accommodation & an unsurpassed range of facilities & activities - all set in a natural environment. Today, play 18 holes on the Hyatt Coolum Golf course. Resort golf in Australia doesn’t get better than this 72 par, 6263 meter course. It offers contrasting landscapes, from coastal holes adjoining the Pacific Ocean to manicured fairways that weave their way through native bushland. Designed by renowned golf course architect Robert Trent Jones Jr, a round of golf at this superbly challenging course is complemented by an ideal sub-tropical climate. Spend a day at leisure, relaxing at the Resort, by the pool, or on Coolum’s magnificent beach. Located 20 minutes north of Cairns is Paradise Palms Resort & Country Club - a world-class experience spanning contemporary accommodation, championship golf course, clubhouse, restaurant and conference facilities. You’ll spend 4 night here. Constantly ranked as one of Australia’s best and most challenging courses, the Paradise Palms course offers a combination of sweeping fairways, snaking creeks, six lakes, narrow undulating greens and 94 bunkers. You’ll play 18 holes of golf here today. The course is a great test for golfers of all levels. With no shared fairways, from every tee the golfer is presented with a truly spectacular and demanding layout. Adeptly described as one of the most serene playing fields to be experienced, the backdrop alone is worth the effort – regardless of form. Designed by Graham Marsh and Ross Watson and first opened in 1990 the par 72 course measures 6,592 meters off the championship tees (with four tee spots on offer) and its’ AGU rating of 76 offers the first clue as to the scale of the challenge that awaits the keen golfer. Today you’ll journey to a reef at the very edge of Australia's Continental Shelf, to an underwater world that is a dazzling kaleidoscope of color and brilliance. Agincourt Reef is a magnificent ribbon reef where you can experience firsthand the magic that is the Great Barrier Reef. You can choose to dive, snorkel, or stay dry and explore the stunning reef from the comfort of a semi-sub, just one meter underwater. Watch the fish feeding from a unique underwater viewing platform and underwater observatory or fly in a helicopter (additional cost) over the reef. Your day beings with a luxury coach transfer from your accommodation to Freshwater Railway Station for a historical rail journey to Kuranda. Enjoy breathtaking views enroute, including the cane fields of Cairns to the tropical rainforest of Kuranda. From Kuranda, relax & enjoy the world's most beautiful rainforest gondola experience. You can stop to explore the two stations, including boardwalks & Interpretive Centre. After, our coach will collect you & transfer you to Hartley's Crocodile Adventures - the best place to see crocodiles in Tropical North Queensland. Explore the rest of the park with its abundance of wildlife, including water birds, turtles, wallabies and cassowaries. Discover the world's most venomous snakes at the Snake Show before the return transfer to your accommodation. Stylish Sydney…a cosmopolitan international city filled with vibrant life, character and a sense of daring. The multiculturalism means a wealth of amazing dining experiences. 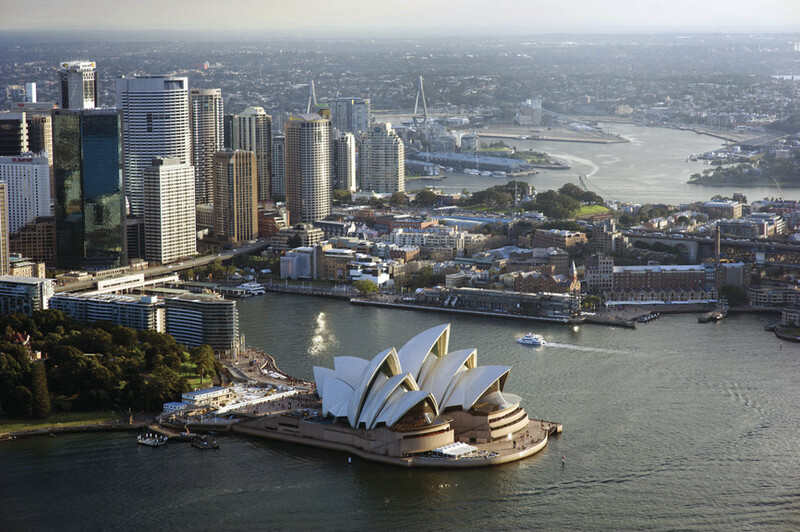 While you will find all the icons you know, such as the Opera House and Harbor Bridge, you will also find interesting people, cultural vibrancy and a positive spirit. You’ll stay 3 nights in Sydney at The Grace Hotel - Sydney's elegantly restored, heritage-listed art-deco hotel right in the heart of the city. Sydney Harbor is like no other. Inside its narrow heads lie more than 155 miles of bays, coves, beaches and promontories just waiting to be explored. Cruise aboard Sydney's flagship MV Sydney 2000. Enjoy stunning views from the upper deck, superb dining and attentive service. Enjoy a contemporary a la carte 2 course menu. See inside the world's most recognizable sails. Experience this miracle of architecture and engineering. A work of art that came into existence against impossible odds - to become one of the busiest performing arts centers in the world. Working with new, rich audio-visual components, where images are projected onto the fabric of the building - our guides will take you on an emotional journey, engrossing you in a story to rival any opera plot with its dramatic twists and turns. A Division of Falls Travel, Inc.